To stop salt moving in to our low salt prone areas and to build a feed reserve. You have feed in March for your stock, which for our operation has always been a hard and often a very expensive time to manage through. This small area of bush has given a surprising lift to our other pasture country. We are not running extra stock yet, so our ground has better cover. It is really good to see this happen. Nothing direct yet but I know our country is getting better. This is hard to put a direct dollar value on but it has to be worth lots. To just know that we have a tool that works to stop our country salting. We planted trees the same time as the 2nd year of saltbush and they have done no where near as much good for the ground as the saltbush. It is hard to get the saltbush planted in wet years. The planting is slow and needs to be done properly. Our first years planting was rushed and so had a greater number of losses than our later planting. Do you / if you had a salinity problem, do you think OMSB would help with controlling deep drainage and/or lowering the water table? Salt is near us and the saltbush we have planted is dropping the ground water. It does work even though some department people told us it wont and we should only be using trees. What limits your planting of a larger area? Money and fitting in with cropping. 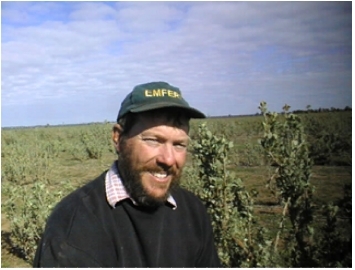 Warwick & his brother Ross started planting omsb as a plant from problem areas on their property. As time has gone on the benefit gained from having guaranteed feed off the omsb has been appreciated. Hanson's Treatment of Time: There are never enough hours in a day, but always too many days before Saturday.